The data is copied to another device. Transferring data to the same device (for example, after it is reset to factory settings) is not supported. 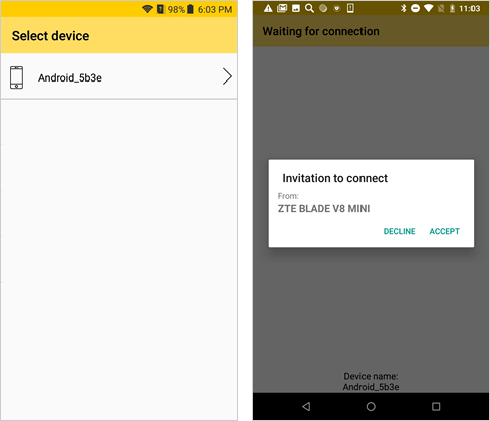 If the data is transferred between devices running Android 2.3.3 / 4.0 and Android 4.1-8.0, then you can only transfer contacts. Connect the device from which you want to transfer the data. In Addappter, click Transfer data → Transfer from current device. The Addappter Transfer application is installed on the device. It starts automatically and suggests choosing the data recipient. Disconnect the device from the computer. Connect the recipient device to the computer. The Addappter Transfer application is installed on the device. It starts automatically and waits for the connection. Remember the device name displayed at the bottom of the application screen. The source device will display the list of available devices. Click the destination device name. If needed, allow the connection on the destination device. Wait until the devices are connected. If there is no connection after 10–15 seconds, turn off Wi-Fi on both devices and restart the Addappter Transfer application. On the source device, specify what needs to be transferred: contacts, messages, WhatsApp application history, or photos. You can view the size of the data and the amount of free space on the destination device in the lower part of the screen. Then click the Send button. On the destination device, tap the Allow button. If the device prompts you to change the current SMS application to Addappter Transfer, tap Yes. Wait until the data is transferred. The source device will display the “Success” message. If the destination device prompts you to use the default SMS application instead of Addappter Transfer, tap Yes. Then tap Close on both devices. If the transferred data isn't displayed on the destination device, restart it. Connect the device from which you want to transfer the contacts. In Addappter, click Transfer contacts → Transfer from current device. Addappter will start copying the contacts. Wait for the operation to finish and disconnect the device from the computer. Connect the recipient device to the computer. Make sure both devices support data transfer. 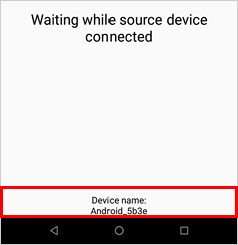 If Addappter reports that the phone isn't supported while trying to transfer the data, or if the transfer is only partially completed, reconnect the device and try to move the data once more. If the data transfer fails, contact the support service.